The US Navy has test fired the latest version of their electromagnetic rail gun at 33-megajoule. That is three times the energy used in the previous record setting shot in 2008. The non-explosive, conductive bullet comes out of the barrel at speeds up to Mach 7 (4620 Mph / 7435 kph) and can hit a target 100 miles away in just minutes. A single megajoule is roughly equivalent to a 1-ton car traveling at 100 mph. Multiple that by 33 and you get a picture of what would happen when such a weapon hits a target. There's also a cost and logistical benefit associated with railguns. For example, a single Tomahawk cruise missile costs roughly $600,000. A non-explosive guided railgun projectile could cost much less. Then there's the question of electrical requirements. Up until recently, those requirements simply weren't practical. However, the naval researchers believe they can solve that issue using newer all electric Navy ships with capacitors or flywheels to build up the charge necessary to blast a railgun projectile out at supersonic speeds. Ellis says they hope to be able to shoot 6 to 12 rounds per minute. 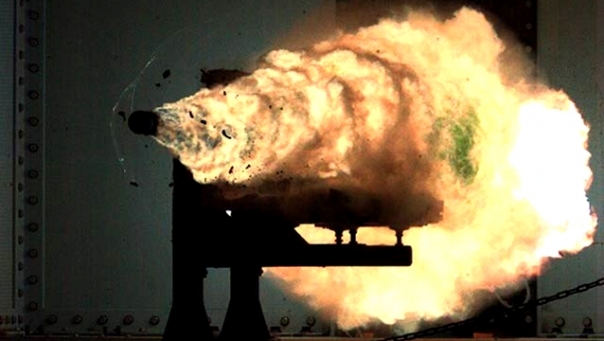 The Navy expect fully functional railguns on the decks of U.S. Navy ships in the 2025 time frame. The powder also surrenders to electromagnetism.